Steve Robinson won two races. 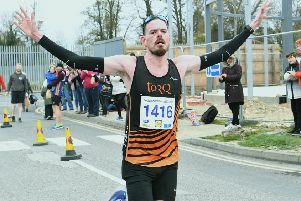 Peterborough Athletic Club may only have finished fourth out of the five teams competing in their Southern League Division Three (North) match at Sandy, but they still had plenty to shout about. On the track they were the dominant force over the long-distance races securing maximum points in both the men’s 5,000m and 2,000m steeplechase. Steve Robinson cruised to victory in the 5,000m A race in 15.53.51 - almost a minute clear of the runner-up - while in the B race Amittai Ben-Israel won by an equally emphatic margin in a personal best (PB)16.32.73. In the chase Shaun Walton won the A race easily in 7.21.88 with James Whitehead clocking a PB of 7.42.51 to take the B race honours. PAC also provided the winner of the women’s 2,000m steeplechase in the shape of Rachel Gibbs. She won with a PB of 9.56.72 and picked up a second A string success when hitting the tape first in the 3,000m in another PB of 10.38.77. Robinson and Walton were also double winners with Robinson adding the 1500m B race spoils to his 5,000m victory with a time of 4.24.40 and Walton winning the 800m B race in 2.08.90. Wendy Perkins also picked up two track wins. The Over 35 veteran won the 400m B race in 68.78 and the 800m A race in 2.36.26. The club’s only field event sucecss was provided by Ellie Forrest, who won the B string long jump with 4.71. Match result: 1 Thurrock AC 300pts; 2 Biggleswade AC 242pts; 3 Newham & Essex Beagles 236pts; 4 Peterborough AC 221pts; 5 Vale of Aylesbury 78pts; 6 Luton AC 54pts. 100m - A 5 Zoheb Arif 11.83, B 4 Brandon Howell 12.33; 200m - A 5 Brandon Howell 24.91, B 4 George McDermott 24.92; 400m - A 5 James Sadlier 59.76, B 2 Stuart Haw 57.57; 800m - A 2 Amittai Ben-Israel 2.02.26, B 1 Shaun Walton 2.08.90; 1500m - A 3 Stuart Haw 4.16.72 (PB), B 1 Steve Robinson 4.24.40; 5000m - A 1 Steve Robinson 15.53,51, B 1 Amittai Ben-Israel 16.32.73; 110m hurdles - A 2 Matthew Dalton 17.79; 400m hurdles - A 2 Matthew Dalton 61.53; 2000m steeplechase - A 1 Shaun Walton 7.21.88, B 1 James Whitehead 7.42.51 (PB); High Jump - A 4 Matthew Dalton 1.30; Long Jump - A 4 Zoheb Arif 4.88, B 4 George McDermott 3.70; Triple Jump - A 5 Matthew Dalton 10.02, B 2 Amittai Ben-Israel 8.77; Shot - A 5 Matthew Dalton 7.88, B 3 Brandon Howell 7.26; Discus - A 5 Matthew Dalton 21.12, B 4 Amittai Ben-Israel 11.92; Hammer - A 4 Matthew Dalton 7.44; Javelin - A 5 Stuart Haw 16.70 (PB), B 3 James Sadlier 12.20 (PB)). 100m - A 4 Nichola Gibson 13.73, B 3 Chloe Bedford 14.56; 200m - A 4 Nichola Gibson 28.57, B 4 Chloe Bedford 31.44; 400m - A 2 Nichola Gibson 65.19, B 1 Wendy Perkins 68.78; 800m - A 1 Wendy Perkins 2.36.26; 1500m - A 3 Sarah Caskey 5.59.33; 3000m - A 1 Rachel Gibbs 10.38.77 (PB); 2000m steeplechase - A 1 Rachel Gibbs 9.56.72 (PB); High Jump - A 2 Sarah Caskey 1.45, B 2 Nichola Gibson 1.25; Long Jump - A 3 Stacy McGivern 4.86, B 1 Ellie Forrest 4.71; Shot - A 5 Stacy McGivern 7.56, B 5 Wendy Perkins 5.80; Discus - A 5 Kay Gibson 15.54, B 5 Wendy Perkins 12.92; Hammer - A 5 Kay Gibson 17.81, B 4 Paige Nealon 7.28; Javelin - A 4 Ellie Forrest 18.73, B 2 Chloe Bedford 16.79.